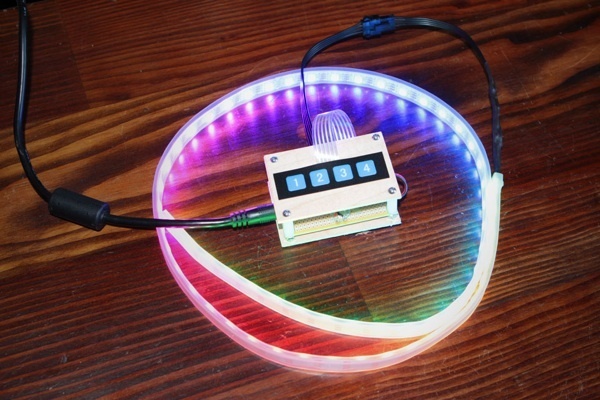 NeoPixel LED Strip Clock « Adafruit Industries – Makers, hackers, artists, designers and engineers! Tim Bartlett shared his LED Strip Clock built around a Teensy and a 1-meter 60-NeoPixel LED strip — with a few tweaks you might be a ble to cheer on the changing of the NeoPixel in the comfort of your home instead of shivering in Time Square for the ball drop! …The LED clock lets you pick different color schemes, add faint dots every 5 or 15 minutes (or none), and turn on blinking hour “chimes.” Right now you need to set these options in the Arduino IDE and re-upload, but I’ll add the ability to change that with buttons or a knob at some point.